Day after day, as anti-Mubarak protesters poured into Tahrir Square in between tank positions and checkpoints, it seemed that the army was facilitating the historic protests. It thus came as no surprise to many that the president, under transparent US pressure, conceded that he would not stand for re-election in September. But he did not fold. His statement on Tuesday night was a gauntlet thrown down to the heaving crowds, a declaration that his third decade of rule would last another nine months. And the following day, thousands of Mubarak supporters charged the square sparking pitched battles with those calling for the president's immediate departure. Mubarak's defiance, alongside the masses' remarkable welcome to the army over the weekend, has led some to conclude that the armed forces - the indispensable pivot of any revolution - would surely swing against their commander-in-chief. Many have jumped to the conclusion that Mr Mubarak will imminently be removed, at the barrel of a tank if necessary. But this is optimistic thinking of the sort that understandably accompanies outpourings of resistance, and particularly so when they wrest victories against oppressors. In failing to understand Hosni Mubarak's strategy and the opposition's options, observers risk agitating for a dangerous escalation, without the adequate muscle. Mr Mubarak has three constituencies: the US-led international community, the military, and his people. Like any beleaguered tyrant, he has had to make tough decisions about how to allocate his sops between them. His chosen strategy deals with them in that order. Sacking the government - and the hated interior minister in particular - was a cosmetic change directed not so much at Egypt's citizens but at the US, designed to project the appearance of earnest and vigorous reform. Not a soul in Cairo or Alexandria could have been moved an inch at the news, but - as Washington's co-ordinated and cagey reaction showed - it bought time from the US. Even when the White House lost patience, its strongest message was to tell Mr Mubarak to quit in September, a pace seen as bordering on the insulting by the thousands who remained outdoors in Cairo. 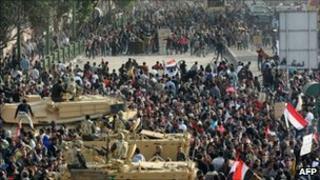 The second step was Mubarak's decision to lay the ground for power sharing with the military. The new vice president, Omar Suleiman, is not only a former general but has also spent decades monitoring the officer corps. The prime minister, Ahmed Shafiq, is a former head of the air force - a traditionally powerful branch of Egypt's armed forces from which Mr Mubarak himself emerged. Far from being a cabinet of desperation, Mubarak is practising exemplary 'military clientelism' - buying off the only group who can effect a coup. For as long as there is no tank commander in Cairo willing to seize a centre of power, there are no means for the activists to translate their historic revolutionary energy into a truly decisive blow against the regime. As their numbers shrink at the news of Mr Mubarak's concessions and their homes go undefended, they will struggle to persuade the military to take such a risk. The army may well "facilitate" protests, but - in the absence of a critical mass of army defections - what it will not do is facilitate a violent capture of the presidential palace. If Mr Mubarak has played his cards well, that defection will never come. Their promise not to shoot is not just a signal of fraternity; it is also an expedient way of retaining the valuable trust of the demonstrators, for which they were praised by President Barack Obama in his speech late on Tuesday. The most unpredictable parameter is the prevailing attitude of junior officers. No-one with any knowledge of Egypt can forget that it was a coalition of such officers that came together in the post-war Free Officers Movement that overthrew King Farouk I and led to the toppling of a succession of pro-British regimes. The military may harbour unseen fractures that come to light only when a decision point is reached. Lastly, what options does this leave the opposition with? Mr Mubarak is effectively 'kettling' an entire country. Over a fifth of the country lives below the poverty line. They cannot protest indefinitely and, unlike the president, they must return to work. In the meantime - with two out of three constituencies secure - Mr Mubarak can play a waiting game. This forces the protesters to endure a harsh status quo or escalate by targeting the bastions of the state, the latter bringing upon them the wrath of an already petrified international community, who may feel it has done its job by putting a limit on Mr Mubarak's term. Those agitating for escalation ought to recall the anti-Saddam uprisings of 1991 by Kurds and others, in which the US first encouraged and then shied away from supporting resistance. The result was massacres under the eyes of the international community.